The first early half tracks had been pioneered by Adolphe Kégresse in 1910, when at the service of the Tsar Imperial Garage. Citröen also used these skills when Kégresse returned in France to design a series of civilian vehicles that made a famous worldwide trip, the “Paris-Pékin”, also known as the “Yellow Cruise”. Schneider, another French company, produced the AMC P16 for the French Army. The US Army bought several Citröen-Kégresse vehicles for evaluation in the late twenties, and developed their own system, still retaining the original flexible belt track. The first prototype, the T7, was the forerunner of a famous lineage, spanning 70 versions and a production of 50,000+ vehicles during WW2 alone. The T7 was ordered by the US Ordnance department, which was looking for a prime mover and reconnaissance vehicle. It was developed by the White company in order to extensively test and improve the Kégresse track system. They mounted it on a custom chassis, with the body and parts from their M3 Scout Car, already in production. The T9 half-track truck, another prototype which was deemed too heavy, gave its Timken rear bogie assembly to the T7, and the lighter vehicle appeared successful on trials. But, being under-powered, the T7 was equipped with a more powerful car engine, eventually giving the T14 final prototype, which was the blueprint for the M2 Half Track Car. It also helped standardization, thus assuring cheap production and easy maintenance. The entire hull, brakes, transmission, forward axle and wheels, machine guns fixations, and even the bumper unditching roller, were copied from the M3. Although longer, many believe that the M2 was basically a Half Track version of the M3 Scout Car. Ground clearance was 11.2 inches (28.4 cm). The White 160AX was a 6 cylinder, 4 cycle, in-line gasoline engine, with a net horsepower of 147@3000 rpm, and a 325 ft*lb@1200rpm torque. Standard fuel capacity of 60 gallons (230 l). 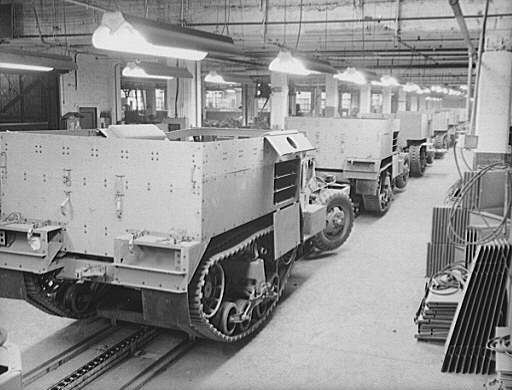 Partially finished M2 halftrack scout cars on the assembly line from the Diebold Safe and Lock Company, Canton, Ohio. The maximum speed on road was 45 mph (72 km/h). The turning diameter was 18 m (59 ft), maximum vertical obstacle 30 cm (1 ft) and fording depth 81 cm (2.67 ft). The front axle had semi-elliptic longitudinal leaf springs, with steel ventilated discs. The rear one had vertical volute spring, one per bogie. The rear suspension had 4 roadwheels mounted on the boogie, with 18-tooth front drive sprockets, and adjustable fixed idlers at the rear. The track was of the center guide band type, 12 inches (30.4 cm) wide, with a 4 inch (10 cm) pitch, 58 links in all. The total ground contact length was 46.75 inches (1.18 meters). The front wheels could be engaged for cross-country travel. In 1941, the first units were equipped with this armored transport, some being based in the Philippines. 11,415 M2 Half-Tracks were produced by White Motor Co. and Autocar Co., a few of them being improved M2A1s. Throughout the war many variants appeared, some 2,085 such M2-based vehicles being produced. They all had the “short hull” along with a relatively weak armor on the sides, stronger rolled face-hardened steel plates at the front, folded protective panels with loopholes for the drivers protection around the driving compartment, with ammunition stowage accessible from the inside or through external side panels. The headlights were mounted on the fenders, but this proved fatal on gun-equipped versions. There was a roomy open trolley equipped with retractable seats, munitions cases, spare parts. Two types of machines guns could be fitted, a heavy Browning 50 cal. M2HB (12.7 mm) and up to three cal.30 M1919 A4 (7.62 mm) machine-guns, with flexible skate mounts. These were later replaced with pintle mounts. The main cal.50 (12.7 mm) was mounted forward, just over the assistant driver’s seat. It had an anti-aircraft and anti-personal 360° M49 ring mount. This provided the M2 with excellent firepower. Their main problem was the weakness of the immovable trolley upper side panels, which were not always able to stop MG 34 and MG 42 bullets. Provision was 700 rounds for the cal.50 (12.7 mm), and 7750 for the others. Depending on the version, additional storage racks were added to carry extra bogie wheels, iron cables or extra ammunition and fuel cases. Nearly all, from the beginning, included the frontal unditching roller, shovel and pickaxe, and fixations for fuel cans. A towing device at the rear allowed them to tow the standard M2/M3 howitzer and other light guns. Later vehicles had smaller, detachable headlights on either side of the hood, and optional anti-ditching roller or a 10,000lb (4500 kg) capacity winch. The M2A1 differed by the machine-gun mounts, and 1643 machines were built, with another 1266 later converted. With eleven main versions and many sub-versions, the M2 was a testbed for many configurations, despite not being armored enough for front-line operations. These changes concerned, first and foremost, adding infantry support armament to the vehicle, added firepower, and adaptations for specific tasks. The first M2 model was equipped with a single, forward cal.30 (7.62 mm) machine-gun. As it was soon found insufficient, a forward M2HB cal.50 (12.7 mm) on a skate rail mount, derived from the M32 truck, quickly became the trademark of the M2. Other sockets for skate mounts were placed, for up to three additional cal.30 (7.62 mm) machine-guns. – The M2A1 introduced the M49 mount for the main caliber and pintle mounts for the secondary machine-guns. – The M9 (M2E5) was the Lend-Lease version produced by the Harverster Co., with a longer hull and rear access doors, and somewhat different internal configuration. – The M9A1 was a sub-version introducing the improved gun mounts of the M2A1. – There were also two self-propelled artillery versions, the mortar ones being the M4 and M4A1s, with a 81 mm (3.2 in) M1 mortar fixed inside the crew compartment. 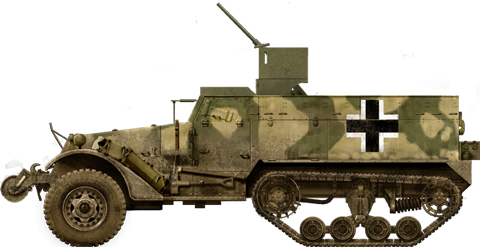 – The M2 w/M3 37 mm (1.46 in) was equipped an antitank gun fitted with a protective shield, forward mounted. AA versions included the T1E1 to T1E3 prototypes, with Bendix and Maxson mounts, or a Martin turret and partial hard-top. – The T28 CGMC had a single M1A2 AA 37 mm (1.46 in) autocannon, which was thoroughly tested and gave birth to the M3-based T28E1. – There was also the T10, featuring a Hispano-Suiza HS.404 20 mm (0.79 in) cannon, which was later used for the T10A1 on the M3 chassis. All these AA experimental versions lead to the successful M3 AA conversions. 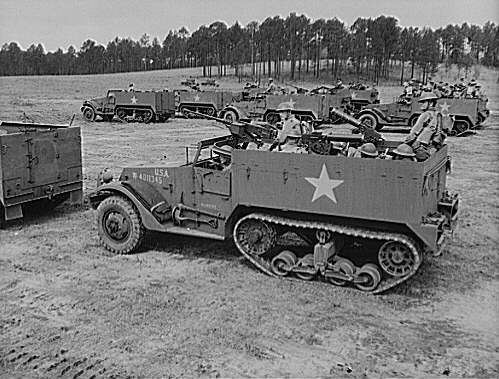 M2 Halftrack scout cars, Fort Benning (Georgia), training. Notice the early liquid-cooled browning standard Machine guns. The M2 was adopted by the US Army and Marines, and was found in all theaters of war, North Africa, Europe and the Pacific. It proved reliable and versatile, and was fielded by British and Commonweatlh forces under Lend-Lease, as well as by many reconstructed Allied forces (Free French, Polish, etc.). The International Harvester Company made an additional 3,500 M9s (an export version of the M2), from which 800 (along with some M2s) were allocated to the Soviet forces. At the end of the war, many surplus Lend-Lease models were sold to South American countries. Some retained their models, with many modifications, until 2009. In all, the M2 was known to have been used by twenty countries, including Czechoslovakia, Chile, France, Greece, Portugal, Brazil, Poland, Israel, Mexico, Nicaragua, Belgium, Netherlands, Cambodia, South Vietnam, Laos, Argentina, and Lebanon. Israel was given many half-tracks and greatly modified them, spanning the Mk.A to D, culminating with the TCM-20, the last modified version. They are still in service today. Pre-series M2 with a single cal.30 (7.62 mm) machine-gun on a central pedestal mount. This was the original gun tractor, with just enough room for the gun crew and large ammunition holds. These were used primarily for carrying M1927 pack howitzers to the battlefield. Here is a model used by the USMC in the Philippines, December 1941. A M2 with the original skate mount in Algeria, November 1942. M2 in Tunisia, January 1943. M2A1 with the M48 gun mount and cal.30 (7.62 mm) pintle mounts. France, June 1944. M2 Half-Track, unknown unit, summer 1944. Beutepanzer M2 (captured T28E1) in 1944. Soviet M2 Half-Track, northern front, winter 1943-44. M4A1 81 mm (3.19 in) MMC, mortar carrier version. The M2 w/M3 37 mm (1.46 in), the tank hunter variant. M3 Half Track with canvas, Italy, 1944, for comparison. A rare picture of a M2 Half-Track in North Africa. I have forwarded your message to David a long time ago and he should have replied already. If not, give us a sign. Would a unit, say a Battalion or Company, have M2 and M3 halftracks in them, would they have been employed side by side? There is no reason not to have them side by side, they were not incompatible in their role. Also, they shared quite some parts. I don ‘t have a clue to what you are talking about. I’ve been hacked or you have been. I asked a question about whether M2 and M3 halftracks were employed together in one unit, such as a company or a platoon. I have no profiles of anything. I have received no answers/emails prior to yours. No one was hacked. He was referring to another David (Bocquelet), our illustrator and founder. I think I’ve seen the set of pictures this Beutepanzer illustration comes from, I believe it isn’t a captured T28E1 but a regular M2 field-modded with a french navy 37mm mle 1925 CAS. I have no idea how this particular combination came to be, however.